When making choices for remodeling your kitchen or choosing the kitchen elements in your new home, selecting complimentary colors and styles is crucial to designing a kitchen you’ll love now and well into the future. Plus, making the right choice will show off your style and ensure an on trend kitchen. Here you’ll find the tips needed to chose an island and cabinetry which harmonize well. The first component to consider is your personal design style and your daily life. For example, the size of your family will help you determine the needed storage in your new kitchen cabinets and island. In the same way, if you have children, you will want to choose cabinetry which is not only durable, but stain resistant. If you do lots of entertaining, you may want to consider special features which home chefs enjoy when choosing your cabinets and your island. In addition, you want to consider your attitude toward cleaning and maintenance. Are you a person who wants the easy to clean maintain surfaces or would you sacrifice a bit of ease in order to get a more aesthetically pleasing style? 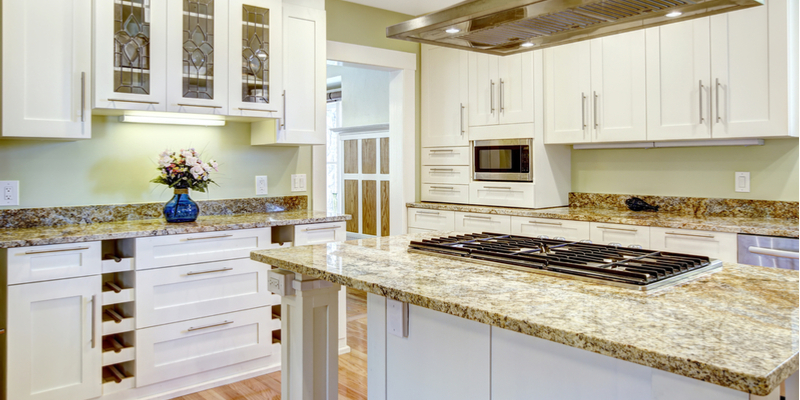 How often do you want to clean and maintain your island and its coordinating cabinetry? This is important to keep in mind when selecting cabinetry and countertops, for while quartz requires minimal effort, marble is more likely to stain, and all natural stone requires more maintenance than other surfaces. And finally, let your sense of style guide you to the island and cabinets which ‘speak’ to you and complement your kitchen style and the overall look of your home. Again, textures and colors are a point of personal style when choosing cabinets and an island. You should make the selection based on what would best suit your kitchen and complement the rest of your home. Neutral tones like grays, taupes, and earth tones, never go out of style and allow you to choose pops of color to harmonize your look while delivering flexibility in making your other kitchen style choices. If you are more conservative, choose classic colors which never go out of style. If you are more daring in your style choices, select a bold color for your island and make it a focal point of the room. Once your cabinet and island colors are selected, then come countertops. Granite and quartz are popular choices. Gray tones offer a classic and sophisticated look and work with most cabinet choices. For lighter cabinetry, choose darker tones to create complimentary contrasts. In like manner, darker cabinetry looks beautiful with lighter granite. If symmetry is your style, give your cabinets and island the same finish for a polished complimentary look. Natural stones are both versatile and beautiful. Many times, homeowners choose their countertops before making cabinetry and island selections. Granite is a durable choice which wears well. Marble is another popular choice for the dramatic aesthetic it brings to the kitchen. For cabinetry, homeowners choose from among hardwood, plywood, or medium density fiberboard (MDF). Hardwoods offer a premium look which is quite durable and able to withstand all that a busy kitchen has to offer. Plywood and MDF are more budget friendly options which don’t require a great deal of maintenance and can be painted should you want to change the color of your cabinets in the future. Contrasting your island and cabinetry with complimentary colors is on trend and promises to make your kitchen a design showcase. Whether you choose a light island and dark cabinets or a bold color island with lighter cabinetry, you newly designed kitchen will be beautiful and functional for years to come.